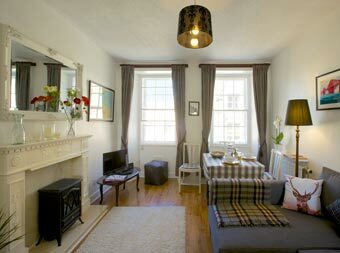 Comfortable accommodation in the heart of Edinburgh's historic Old Town. 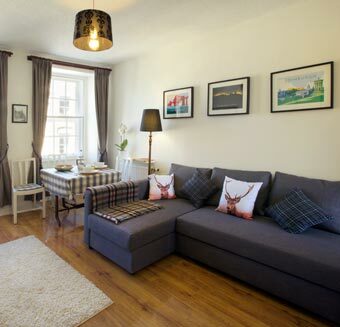 This one-bedroom apartment, sleeping up to four with the livingroom sofa bed, is half way along the Royal Mile, the ancient street between the Palace of Holyrood and Edinburgh Castle. 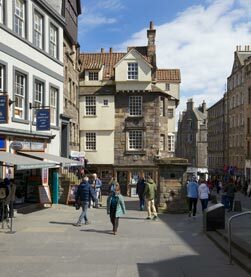 Just opposite is John Knox's house (below right) which dates from the late 1400's and is now a museum and part of the Scottish Storytelling Centre. The apartment is on the 3rd floor (U.S. 4th floor). You can see its four windows in the middle of the photograph, right. 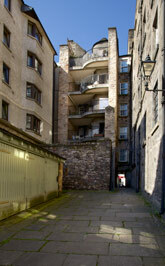 Through the entrance to Tweeddale Court you will find the spiral stairs to the flat. Shared stairs in Edinburgh are often functional and worn-looking. Oonce you are inside the apartment all is well-kept, clean and neat. 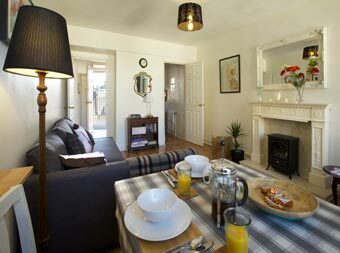 Incredibly central, you can easily walk from here to almost all Edinburgh's cultural landmarks, and there are plenty of places to eat and drink nearby. Living Room: The door on the left goes to the private balcony, the door to the right, the kitchen. Electric log effect fire. Living Room: Table for four. 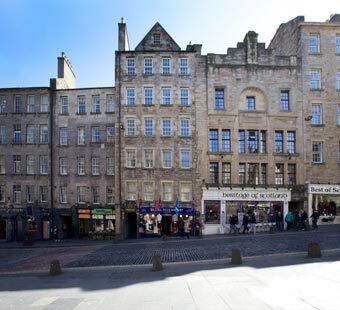 The secondary glazed windows look over the Royal Mile. Double sofa bed. Cot (crib) available, and high chair. TV, DVD, CD player, Wi-Fi. 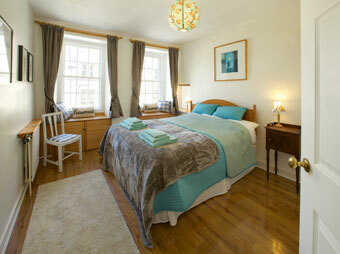 Double bedroom, also with secondary glazed windows overlooking the Royal Mile. 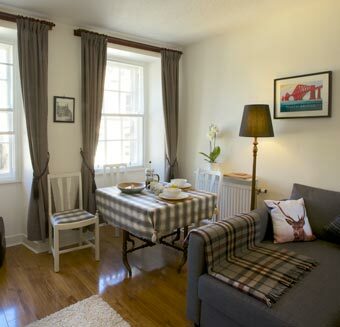 A third small window has views down the street to the Firth of Forth and the sea. 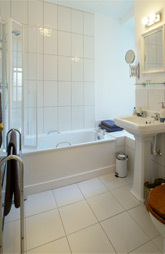 The bathroom has a shower above the bath, basin and wc. The flat has central heating. 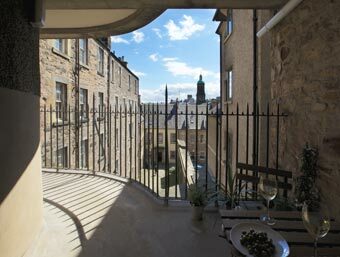 Spacious balcony with small table and chairs, with south facing views over Tweeddale Court. The curved balcony is on the 3rd floor. 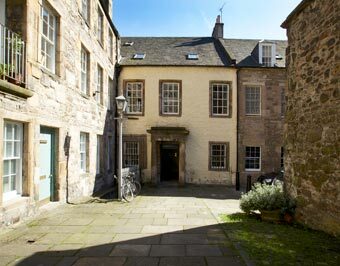 The house at the end of Tweeddale Court which you can see from the balcony used to be the famous publishers Oliver and Boyd, now the HQ of Canongate Books. There's also a part of the medieval city wall, and a shed built as a shelter for sedan chairs in the 1700's - the grey-green doors on the left. 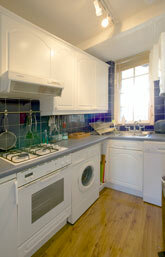 Prices are from £91 per night for the apartment, sleeping up to four. Minimum stay varies with the time of year. 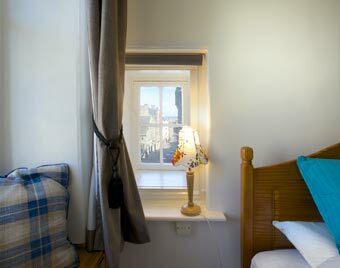 This little window next to the double bed has a view all the way down the Royal Mile to the Firth of Forth. 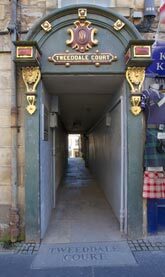 Please tell Kate you found Tweeddale Court through About Scotland!